Mike Reeves-McMillan’s review of What Ho, Automaton! Mike's Reviews > What Ho, Automaton! Once I've said "steampunk P.G. Wodehouse," you're either in or out. But if you're in, let me clear up a few points you might be wondering about. First, is it a good pastiche? Yes, it is. We have Reggie Worcester, clueless man-about-town, and his gentleman's personal automaton Reeves, who had been shut in a cupboard in the Drones Club attic for 14 years. We have Reggie's Aunt Bertha, prize pigs, country houses, accidental and unwanted engagements, and Reeves' giant steam-powered brain proposing ingenious solutions. We also have Prometheans (Frankenstein's Monster-style creatures, human and otherwise). There's no golf, though, and no Mr Mulliner. So is it a perfect pastiche? No, not quite. There are a few words used incorrectly here and there, and there's a slight hint of the risque that never would have made it into Wodehouse. The second adventure adds Sherlock Holmes to the mix, with missing debutantes and a zeppelin, and is more adventure novel than Wodehouse novel. 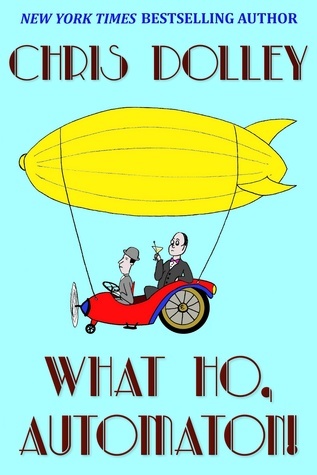 I'd say, though, that if you like steampunk, Wodehouse and Sherlock Holmes you'll enjoy this. I did. Sign into Goodreads to see if any of your friends have read What Ho, Automaton!.